Though they don’t get quite as much ongoing attention as video cards due to their slower update cadence, one of the nicer innovations in the last few years in the gaming hardware ecosystem has been variable refresh displays. By taking displays off of a fixed refresh rate and instead coupling it to the frame rate, the state of gaming on the PC has become a lot more pleasant, especially in the irksome area between 30 and 60 frames per second. As it was NVIDIA to make the first move here in 2013, AMD only ended up rolling out their own variable refresh solution in 2015. 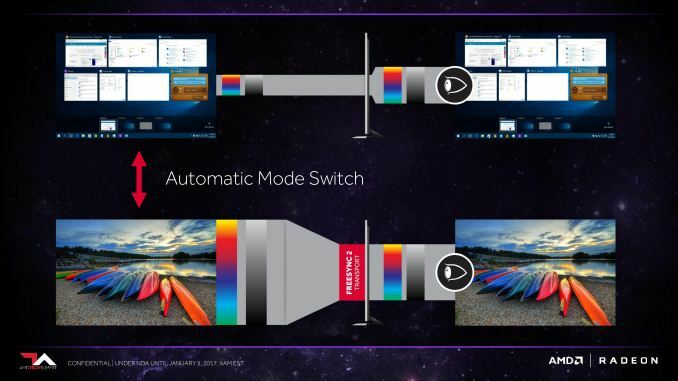 Under the brand name FreeSync, AMD leveraged the VESA’s optional DisplayPort Adaptive-Sync standard to offer variable refresh in conjunction with the major monitor manufacturers. The fact that AMD was second to the market didn’t dampen their enthusiasm (or customers’) too much, but it did mean that until recently they were playing catch-up with NVIDIA on extra features. AMD finally reached (practical) feature parity with NVIDIA just last month when they added support for borderless windowed mode. But now that AMD has caught up with NVIDIA, their attention is quickly shifting to what they need to do to get ahead and where they can go next. Which is a harder area to tackle than may at first be apparent; variable refresh is a fundamental feature, and once you have support for it, it shouldn’t require constant fiddling. The end result is that for their next monitor technology initiative, AMD is tackling more than just refresh rates. 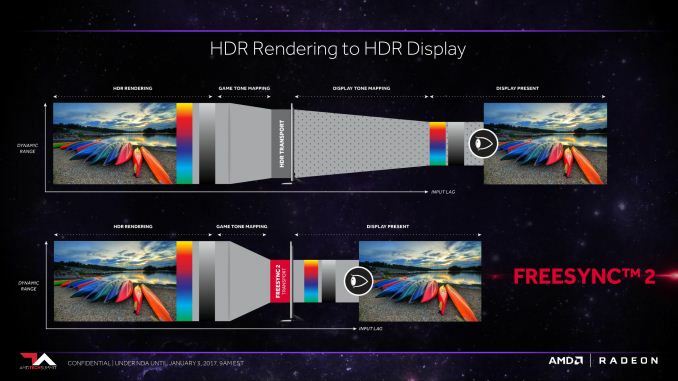 Looking to address the high-end market with a new solution for both HDR and variable refresh, today AMD is taking wraps off of this initiative: FreeSync 2. Trying to explain FreeSync 2 can get a bit tricky. Unlike the original FreeSync that it takes its name from, it’s a multi-faceted technology: it’s not just variable refresh, instead it’s HDR as well. But it’s also a business/platform play in a different way than FreeSync was. And while strictly speaking it’s a superset of FreeSync, it is not meant to replace FreeSync wholesale. Perhaps the best way to think of FreeSync 2 is that it’s a second, parallel initiative that is focused on what AMD, its monitor partners, and its game development partners can do to improve the state of high-end monitors and gaming. In terms of features then, what is easily the cornerstone feature of Freesync 2 – and really its reason to be – is improving support for HDR gaming under Windows. As our own Brandon Chester has discussed more than once, the state of support for next-generation display technologies under Windows is mixed at best. HiDPI doesn’t work quite as well as anyone would like it to, and there isn’t a comprehensive & consistent color management solution to support monitors that offer HDR and/or color spaces wider than sRGB. The Windows 10 Anniversary Update has improved on the latter, but AMD is still not satisfied with the status quo on Windows 10 (never mind all the gamers still on Windows 7/8). As a result FreeSync 2 is, in part, their effort to upend the whole system and do better. For all of its strengths as a platform, this is an area where the PC is dragging compared to consoles – the PlayStation 4 was able to add functional & easy to use HDR10 support to all units as a simple software update – so for AMD they see an opportunity to improve the situation, not only making HDR support more readily available, but improving the entire experience for gamers. And to do this, AMD’s plans touch everything from the game engine to the monitor, to make HDR the experience it should be for the PC. Diving into the technical details then, AMD’s solution is essentially a classic one: throw out what isn’t working and make something that works better. And what isn’t working right now? As mentioned before, Windows doesn’t have a good internal HDR display pipeline, making it hard to use HDR with Windows. Meanwhile HDR monitors, though in their infancy, have their own drawbacks, particularly when it comes to input lag. The processors used in these monitors aren’t always capable of low-latency tone mapping to the monitor’s native color space, meaning using their HDR modes can add a whole lot of input lag. And worse, current HDR transports (e.g. HDR10) require tone mapping twice – once from the application to the transport, and second from the transport to the native color space – so even if a monitor has a fast processor, there’s still an extra (and AMD argues unnecessary) step in there adding input lag. FreeSync 2 then attempts to solve this problem by upending the whole display pipeline, to get Windows out of the way and to offload as much work from the monitor as possible. FreeSync 2 in this respect, is essentially an AMD-optimized display pipeline for HDR & wide color gamuts, in order to make HDR easier to use and better performing as well. The FreeSync 2 display pipeline as a result is much shorter (i.e. 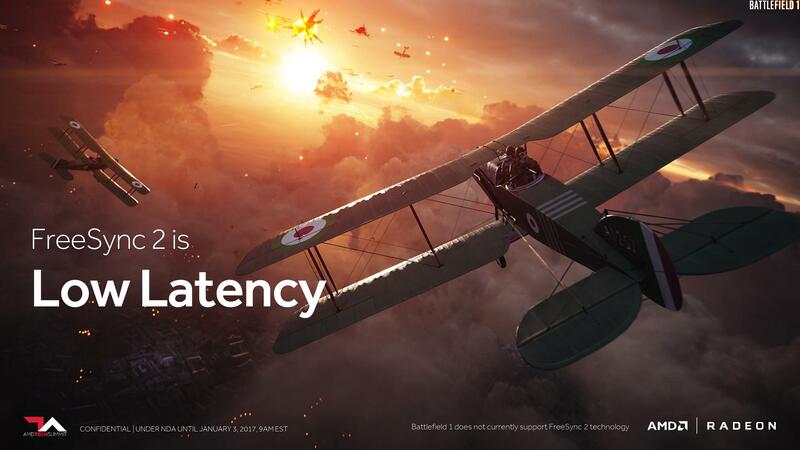 lower latency), and much more in AMD’s control. Rather than the current two-step process, AMD proposes to have a single step process: games tone map directly to the native color space of a FreeSync 2 compliant monitor, AMD’s drivers and hardware pass that along, and then the monitor directly accepts the display stream without further intensive processing. The end result is that latency is potentially significantly reduced by removing the second tone mapping step from the process. Meanwhile on the usability side, AMD’s drivers and FreeSync 2 monitors would implement a form of automatic mode switching. The idea here being that Windows in its current form really doesn’t like anything other than sRGB, so for desktop use, users are better off with their monitor in this mode. However when a FreeSync 2-compatible game is fired up, the monitor and AMD’s drivers would then switch over to the native color space automatically, and back again when going back to the Windows desktop. The ultimate idea here being to make it easier use HDR and wide color gamuts when feasible, and sRGB when not. Overall, this sounds like a reasonable solution to making HDR work in the short-term. AMD can’t fix Windows’ handling of HDR or wide color gamuts – you still don’t have a truly color managed environment on the Windows desktop for windowed applications – but it would be an improvement over the current situation by letting games and other applications call for something better than sRGB when they’re being used in fullscreen exclusive mode. 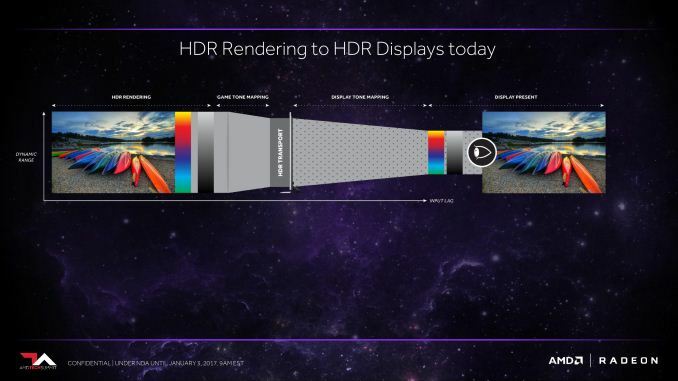 However to make all of this work, AMD will need to bring together both display manufacturers and game developers, and this is likely to be the trickiest part of AMD’s plan for FreeSync 2. Under the hood, AMD makes this shortened display pipeline work by having games tone map directly to a monitor’s native space, but to do so games need to know what the specific capabilities are of the attached monitor; what color space it can render to, and over what brightness range. This isn’t something Windows’ APIs currently support, and that means AMD has to provide a FreeSync 2 API instead. And that means AMD needs to get developers on-board. The good news for AMD (and developers) is that the actual implementation of FreeSync 2 should be quite simple since most games are already rendering in HDR and tone mapping to at least SDR to begin with. Game developers only need to query for the API, tone map to the specifications AMD provides, and then from there it’s AMD and the monitor’s problem. But counting on developers to do anything extra for PC games is always a risk, one that has hurt initiatives in the past. For their part, AMD will be doing what they can: focus on the upstream engines and developer relations/evangelism. 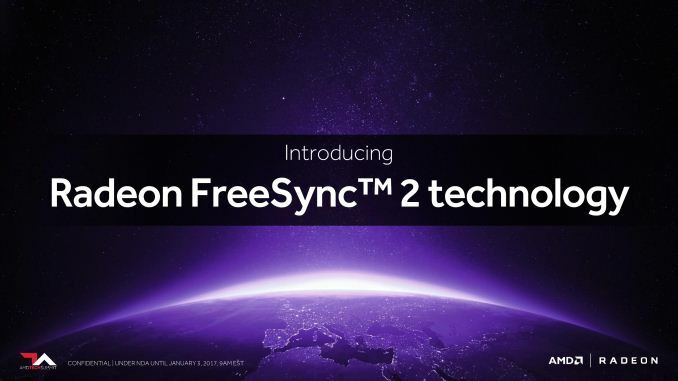 By getting FreeSync 2 support added to major engines like Unreal Engine and Unity, AMD makes it much easier for downstream developers to adopt FreeSync 2. Beyond that, it’s about convincing developers that supporting FreeSync 2 will be worth their while, both in terms of sales and improving the customer experience. On the flip side of the coin, getting monitor manufacturers on-board should be relatively easy. AMD’s original FreeSync effort was extremely successful here (to the tune of 121 FreeSync monitors), in part because AMD made it such an easy feature to add, and they are aiming for something similar with FreeSync 2. It doesn’t sound like display controllers need to be substantially altered to support FreeSync 2 – they just need to have a tone mapping bypass mode and understand requests to switch modes – which would make it easy for the monitor manufacturers to add support. And for their part, the monitor manufacturers like features like FreeSync because they can be easily implemented as value add features that allow a monitor to be sold for a higher price tag. On a final note, while the FreeSync 2 initiative as-planned requires game developers to buy into the ecosystem by supporting the related API, I did take a moment to ask AMD about whether they could do anything to better support games that might offer HDR support but not use AMD’s API. The answer, unsurprisingly, was “no comment”, but I got the distinct impression that it’s a question AMD has considered before. Without direct API support there’s still a need to do tone-mapping twice, and that would negate some of the latency benefits, but AMD could still potentially do it a lot faster than the display processors in some monitors. If AMD were to struggle with developer adoption, then that alone could still make FreeSync 2 worth it. Earlier I mentioned that FreeSync 2 is really a collection of several idea/features, and while HDR is certainly the marquee feature of FreeSync 2, it’s not the only feature. With FreeSync 2 AMD will also be tightening the standards for what variable refresh functionality that approved monitors need to support. The open nature of FreeSync has led to a large number of monitors that support the technology across a wide range of prices, but it has also led to a wide variety in how useful their FreeSync implementations are. A number of basic monitors on the market only support a range of 30Hz to 60Hz, for example. And while this is still useful, such a narrow range means that these monitors don’t deliver a very good experience below their minimum refresh rate. These monitors can’t support FreeSync’s Low Framerate Compensation (LFC) technology, which requires the maximum framerate to be at least 2.5x the minimum framerate (or 75Hz for our 30Hz monitor). As a result, AMD has tightened the standards for FreeSync 2. 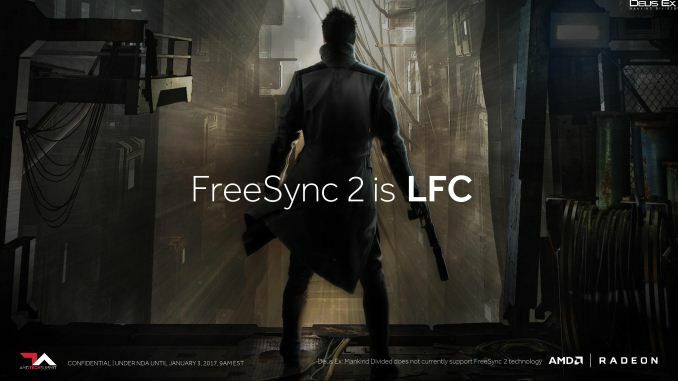 All FreeSync 2 certified monitors will be required to support LFC, which in turn means they’ll need to support a wide enough range of refresh rates to meet the technology’s requirements. Consequently, anyone who buys a FreeSync 2 monitor will be guaranteed to get the best variable refresh experience on an AMD setup, as opposed to the less consistent presence of LFC on today’s FreeSync monitors. Similar to this and AMD’s HDR efforts with FreeSync 2, AMD will also be mandating a general low latency requirement for the new standard. It’s not fully clear just what this will entail, but at a high-level AMD is going to require that monitors be low latency in SDR mode as well as HDR. The final shift in FreeSync 2 – and really what makes it a parallel effort as opposed to a replacement for FreeSync 1 – is how AMD will be approaching the market. The costs of meeting the HDR and variable refresh requirements for FreeSync 2 means that this is very much a play at the high-end monitor market. Budget monitors won’t be able to meet these requirements (at least not right away), so AMD’s focus is going to be on the high-end of the market. The significance, besides the parallel standards, is that it will impact how AMD goes about certifying monitors, and potentially how “free” FreeSync 2 ends up being. The additional requirements mean that AMD will need to run a more complex certification program. They will need to bring in monitors to profile their native color space and confirm they meet the latency & refresh requirements. All of which cost time and money for AMD. As a result, when questioned on the matter, AMD is not currently commenting on the subject of FreeSync 2 royalties. Presumably, AMD is pondering the idea of charging royalties on FreeSync 2 hardware. The subject of royalties on gaming hardware is not a very happy subject, nor is it one that too many companies like to talk about. NVIDIA for their part does charge manufacturers a form of royalties on their G-Sync technology – this being part of the impetus for AMD calling their variable refresh implementation FreeSync – and while no one will go on record to confirm the numbers, what rumblings I’ve heard is that G-Sync is “not cheap.” But numbers aside, at the end of the day this makes variable refresh a value add feature for NVIDIA just as much as it does their monitor manufacturer partners, as they profit from the sale of G-Sync monitors. At the same time it also means that the ongoing development of G-Sync is self-sustaining, as the program can now be funded from G-Sync royalties. There are a number of assumptions in here, but ultimately the fact that AMD isn’t immediately rejecting the idea of royalties could prove to be a very important one. Royalties at a minimum would help fund the certification program, and taken to the same extent as NVIDIA could become another revenue stream entirely. And since FreeSync 2 is aimed at high-end monitors, it would allow AMD to claim a piece of the pie on their own value add feature, as high-end monitors can fetch a significant profit of their own. Negatively however, it would also likely push FreeSync 2 monitor prices up, making them less affordable. At any rate, while AMD is pondering royalties on FreeSync 2, they won’t be giving up on the free-as-in-speech aspects of FreeSync 2. AMD tells us they will still be pushing for technological openness so that everyone can see how FreeSync 2 works, even if ultimately AMD decides to charge monitor manufacturers to make it work with their video cards. Ultimately, where exactly we’ll end up remains to be seen, as AMD is very much still in the early stages of planning with FreeSync 2. Wrapping things up, now that we’ve covered the proposed feature set of FreeSync 2, let’s talk about hardware compatibility. AMD has repeatedly touted the flexibility of their more recent display controllers, and this is once again going to be the case when it comes to FreeSync 2. Because all of AMD’s FreeSync 1-capable cards (e.g. GCN 1.1 and later) already support both HDR and variable refresh, FreeSync 2 will also work on those cards. All GPUs that support FreeSync 1 will be able to support FreeSync 2. All it will take is a driver update. Admittedly I don’t see too many Radeon HD 7790 or R9 290X owners shelling out for what will likely be an expensive generation of HDR monitors, but it’s nonetheless neat to see that AMD will be able to bring that tech to older cards. More practically speaking, this means that recent buyers of the RX 480 and other Polaris cards won’t be left out in the cold once FreeSync 2 arrives. And when will FreeSync 2 arrive? The answer to that is a bit less clear. AMD is not setting any hard dates and is not announcing any monitors today. They are only announcing the start of the FreeSync 2 initiative. They still need to finish writing the necessary driver code and bring on both hardware and software partners. The nature of their presentation makes it sound like FreeSync 2 is something that should arrive this year. Certainly the timing is right given the impending launch of HDR-capable PC monitors. But as FreeSync 2 relies on a number of external factors, I suspect AMD wants to avoid making promises they can’t deliver on alone. In the meantime AMD’s initiative will definitely bear keeping an eye on. AMD is pushing the right buttons with their plan to improve the state of HDR gaming on the PC. If they and their partners can deliver on what they propose, then it would mean that HDR gaming on the PC would shine far more brightly than it otherwise would. AFAIK apple has proper color support.